system in the fiscal year 2007 and 2008 audited financial statements. In this audit we examined the extent to which the system addressed billing and collections problems noted in previous audits. 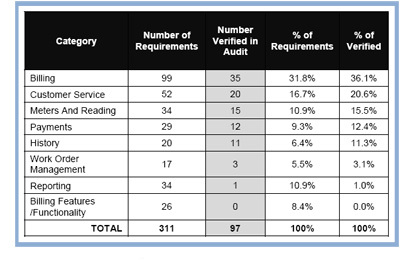 7 of 97 requirements we tested were not implemented. Key system settings failed to enforce watershed management’s security policy, allowing users to set passwords that were shorter than required and for some users to keep the same passwords indefinitely. The department allows system access through generic accounts not assigned to an individual.